High-throughput SNP genotyping methods have been developed in order to exploit the many healthcare benefits which will arise from a detailed knowledge of genetic variation. [1-3] SNP genotyping technologies have two components—a method for determining the type of base present at a given SNP locus (allele discrimination), and a method for reporting the presence of the allele(s) (signal detection). [4-6] There are three general allele discrimination methods: hybridization/annealing (with or without a subsequent enzymatic discrimination step), primer extension, and enzyme cleavage. In each case, the technology platform may be homogeneous (in solution) or heterogeneous (involving both a liquid and a solid phase, such as a microarray). 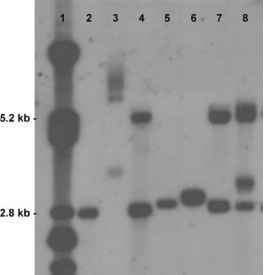 Some of the assays require prior amplification of the genomic target, whereas others are sensitive enough to work directly on genomic DNA or cDNA. There are many signal detection platforms, and most of these follow the fate of a label either in real time or at the assay end point. Uniquely, mass spectrometry can be used to detect the allele-specific product of a discrimination assay without the need for a label, by distinguishing the masses of DNA molecules containing alternative bases. The simplest method for discriminating between alleles at an SNP locus is hybridization using allele-specific oligonucleotide (ASO) probes. 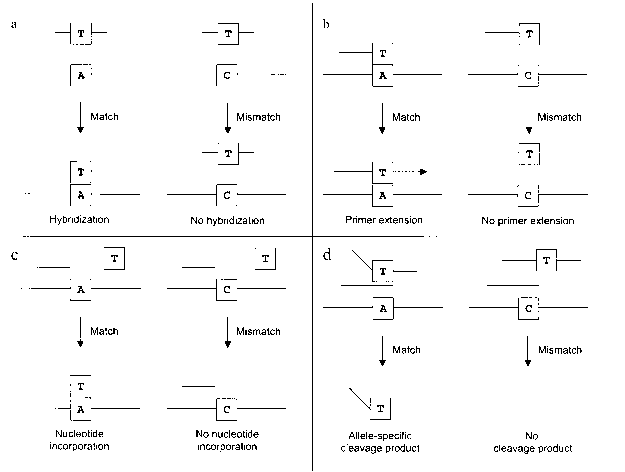 Two probes are required— one specific for each allele—and stringency conditions are employed such that a single-base mismatch is sufficient to prevent hybridization of the nonmatching probe (Fig. 1a). The ASO probes can be used as labeled/ unlabeled pairs, in which case two separate assays are required to genotype each SNP, one in which probe 1 is labeled and probe 2 is unlabeled, and one in which these roles are reversed. Alternatively and preferably for high-throughput assays, distinct labels can be used for each probe (e.g., different fluorophores or mass tags), so that each SNP can be genotyped in a single reaction. More sophisticated assays, such as TaqMan, use allele-specific hybridization as the primary discriminating reaction, but additional enzymatic steps are required to detect the signal. Allele-specific polymerase chain reaction (PCR) is a modification of allele-specific hybridization in which discrimination is achieved by allele-specific primer annealing (followed by PCR amplification) rather than the direct detection of a hybridized people (Fig. 1b). Although it is possible to use a strategy in which the variable base position is in the middle of one of the primers, which is directly analogous to the ASO technique, this allows the extension of a mismatched primer/template if stringency conditions are not optimized. A more sensitive approach is to place the 3' end of one of the primers at the variable base position because extension is dependent on perfect complementarity at the 3' end of the primer.